Along the top shelf – Realistic DX-394 receiver (used for monitoring trx audio); MFJ-993B Intellituner; Yaesu G-450C rotator control; Ten-Tec Jupiter 538 HF rig; Yaesu SP-901 speaker. Along the bottom shelf – Yaesu FT-101ZD HF rig from 1981; Yaesu FL-2100Z linear amplifier (currently in need of repair); Yaesu FC-902 ATU. On the desk top – Yaesu VX-7R handie; and Yaesu VX-6 handie belonging to MM3YVQ; West Mountain Radio Rigblaster Pro interface (currently used for Echolink, GM6MEN-L); PC, used for Echolink. Under the desk – Anytone AT5555-N 10m multimode; Team ME4 Chicken Box (barely visible, but it is there); Yaesu FT-1802 2m rig. On the pedestal – Yaesu FT-847 HF, VHF, UHF transceiver. 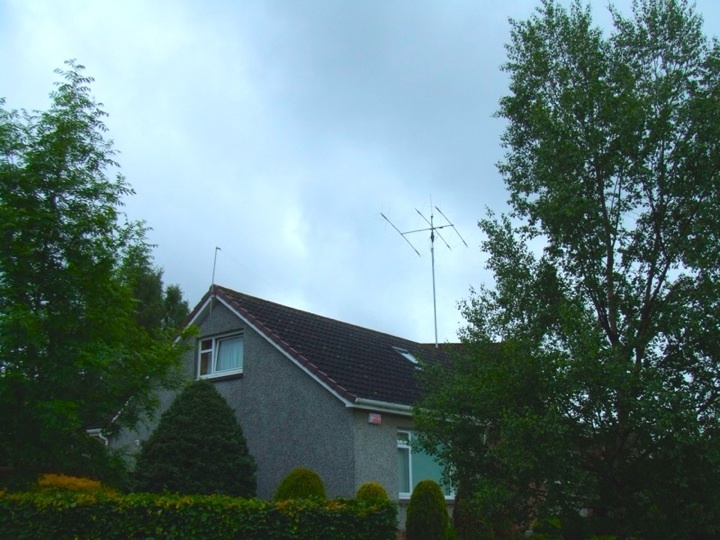 The main antenna system is an MA5B mini-beam for 20m to 10m, mounted on a Tennamast 10m Adapt-A-Mast – see below – plus a random length doublet mounted just above the roof which I have used to remarkable effect on 40m. I currently do not have antennas for 80m, 6m, or 4m. On 160m I have occasionally used a snake antenna.